Joe and Doris Lindner know great burgers. And they’ve tasted them all. The Lindners have spent the better part of three years on a cross-country quest to visit each of the “51 Great Burger Joints” listed in an October 2010 USA Today article. The list included one place for each state, plus the District of Columbia, each recommended by a local foodie. The Hilton Head Island, S.C. couple had ticked the boxes on 50 joints by July 2012, but there was one more — Village Burger Kamuela. On a sunny April morning, the couple of retired doctors finally crossed that last one off the list and, in something of a full circle, enjoyed the meal with the same members of the family who started the journey in Denver back in October 2010. Doris explains just how the adventure started. “We were in Denver when the article came out, so we said let’s try it,” she said, recalling a visit with their daughters in Colorado. Since then, they tried burgers with egg and fried bologna, with french fried green beans, and even a kangaroo burger. “All I can say is … usual, but good,” Doris said of some of the more exotic creations they’ve tasted. Technically, they haven’t completed the list, as two restaurants closed since the list first appeared. “So we didn’t get to eat the burgers, but we got photos of the outside, so we have actually been there,” Doris said. Joe said he’ll remember more than just the burgers. 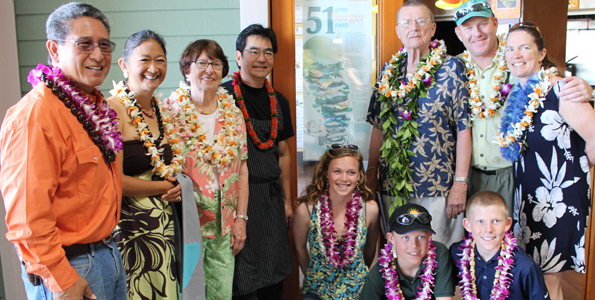 With them on the Hawaii trip were one daughter, son-in-law and several grandchildren, including 14-year-Logan. Logan has inspected the three huge binders that document her grandparents’ journey – including photos, receipts and Grandpa’s reviews – and said she might be inspired to start her own food journey. Restaurant owner Chef Edwin Goto was thrilled to welcome the Lindners, especially as it coincided with the restaurant’s third anniversary. Goto said it was extra special to celebrate the anniversary with the Lindners. 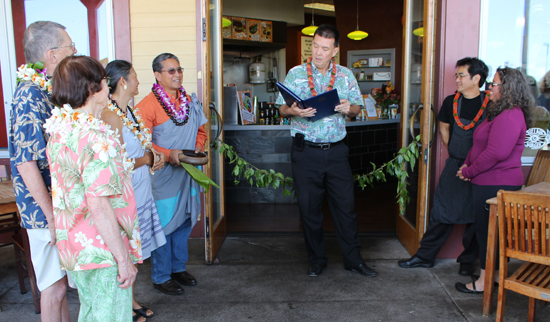 The family was welcomed with a presentation by Kahu Danny Akaka, a hula performance by Akaka’s wife Anna, and proclamations from Mayor Billy Kenoi, Sen. Malama Solomon and the Big Island Visitors Bureau. 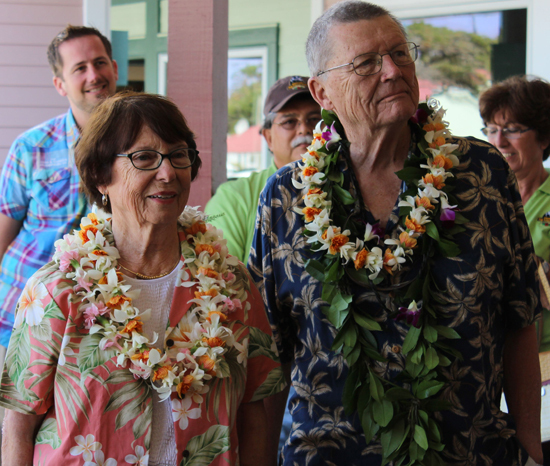 The couple also helped untie the giant maile lei at the restaurant entrance. Also on hand were some of the restaurant’s local vendors — farmers, bakers, ranchers and other food providers. Doris was touched by the welcome. “Yeah, it’s a pretty great day for us, too” Goto said. After a Hawaii vacation and a Village Burger, the couple is ready for the next quest.